Whether it is ESE or GATE, an aspirant should structure his preparation strategy in such manner that he completes the exam syllabus well before time in a hassle-free way, leaving enough time for revising what has been learned. This will save him from last minute panic attacks. One should go forward with his preparation by setting small goals, and meeting them without fail. In this way, an ESE or GATE aspirant will stay cool and calm, which is very much required during preparation for these top competitive exams for engineers. Understanding the syllabus and exam pattern: The first step of the preparation strategy for any exam is going through the syllabus of that exam. This will help a candidate in categorising the topics into easy, moderate, and difficult, and start his preparation in a systematic manner. The next step is to know about the exam pattern. Understanding the pattern will facilitate an aspirant in knowing how to attempt questions, and how much time should be devoted in attempting each question. Recalling whatever has been learned: Revision is a very integral part of the preparation strategy for ESE and GATE preparation as this will help a student keep a tab on his progress. Revision will let him identify the topics which are his strength, and the topics that require more practice. The best way to revise is through short notes that have been prepared during the first or second round of reading the topics. Try to revise at least once or twice, depending upon the weightage of marks the topics carry. Revision will also help an ESE or GATE aspirant sit in the respective exam with the desired boost in confidence. Following time-bound preparation strategy: Equal importance should be given to all the topics during preparation, as no hard and fast rule is followed while setting the question paper. As per past toppers of these exams, an aspirant should take on all the subjects together during his preparation rather than taking one after another. Right time to start preparation: Every exam has a unique pattern and standard on the basis of which one should start preparing for the exam. Starting early is appropriate, but too early can makes the preparation a bit boring as the passion gets lost at the time when is needed. As per past ESE and GATE toppers and rankers, the appropriate time to begin preparing for ESE and GATE is just after the second semester or the moment you start B.Tech studies. 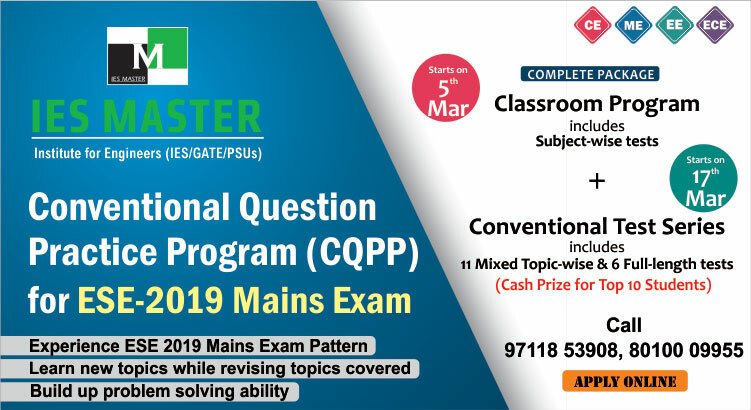 The right time to start preparing for ESE or GATE can vary from person to person, however it is recommended to prepare for these exams under the guidance of subject experts at the best coaching institute for ESE and GATE. 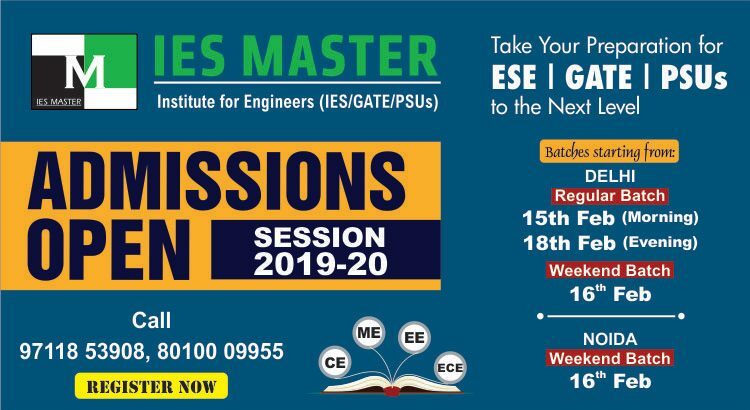 IES Master, a Delhi-based institute for engineers, conducts many study programs that can help engineering students from CE, ME, EE, and ECE branches in their preparation for ESE and GATE. Depending on the time in hand, and the year in which a candidate is targeting to take the ESE or GATE exams, the various options of study programs at IES Master are: Two-year Classroom Program with regular and weekend classes, Subject-wise Improvement program for selective study and guidance, Genius batch for smart engineers, and many more. For session 2019-20, admissions for all these programs at IES Master are currently open. Candidates, who wish to register themselves for any of the above programs can contact IES Master Delhi Help Desk at 80100 09955 or drop a mail at info@iesmaster.org to know in detail about all or any of the above-mentioned study programs for ESE, GATE and PSUs. For admissions at IES Master Noida, call 0120-415 1100 or mail at info.noida@iesmaster.org.